Beta 2.6 turned out to be another long one in terms of bug fixes and improving the new additions we brought forth in the release. We got up to six patches before eventually moving on to the next major update. Added a “Simulated Turns” multiplayer mode, which allows time/turn passing as long as players are performing actions, otherwise the game will be paused. The Debug Tools mod has been completed redesigned and has a brand new feature set. Shout-out to Yuudaari for this! 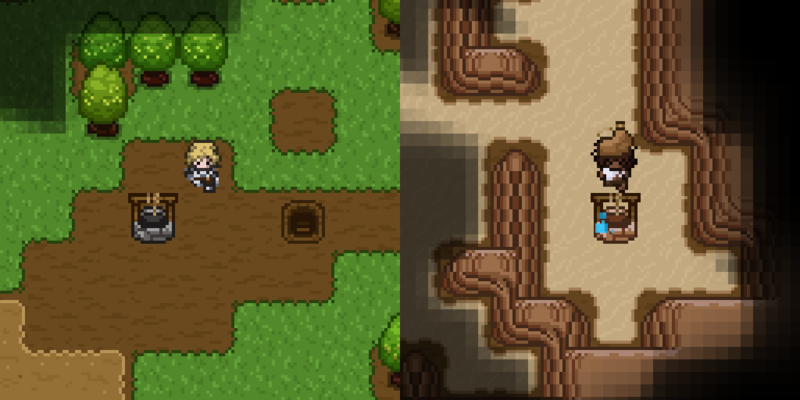 Added NPCs to the game that will spawn rarely and randomly in your world that you can barter and trade with. It was a bit too rare at the start, but we recently tweaked this a bit. Although, as it turned out, it may need some more tweaking for longer games. You can now pathfind/move automatically to a tile using ctrl + left click (or middle mouse click) by default. You can now use adjacent tiles with items or containers as a source for crafting ingredients and recipe discovery. This was later improved to also be used for dismantling/disassembling as well. Finding people to play with is hard and laborious. To help everybody (including those that graciously hosted dedicated servers in the past), we are replacing the “Friends” menu with a server browser that will show all public multiplayer games (or ones that your friends are in). The daily challenge mode in Wayward has never been the most engaging. It’s basically just a harder version of the game with no saving. We want to redesign this from the ground up to be a quick pick-up game with unique modifiers and goals/challenges. We envision these games to last around 30 minutes to 1 hour in length (from start to death or win). A great side effect of adding in custom modifiers for the daily challenge is we can add a custom game mode where players can pick and choose them for their own normal game. Things like decreasing hunger/thirst rates, disabling creature hostility, modifying reputation rates, and more. We don’t have a great amount to show yet as everything is still kind of sitting in a state of “half-done”, but there are a few things we can at least preview. Tooltips are getting a face-lift! World tooltips are much easier to read/scan and feature expanded information. 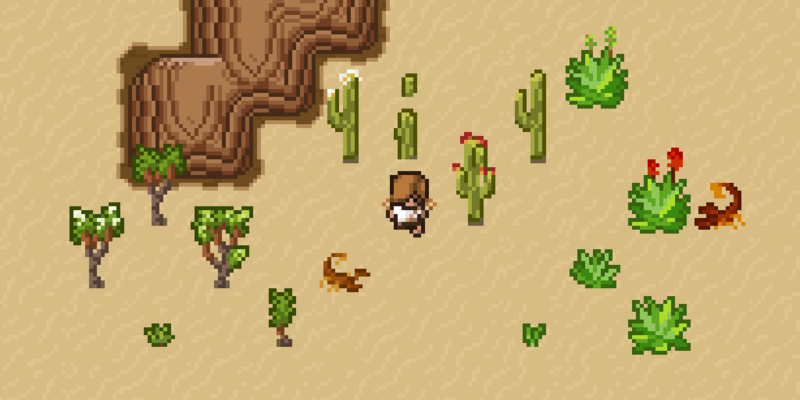 The desert areas are about to look a lot better and feature some more unique content. We’re adding three new plants, a new desert creature, and even a new tile into the mix. Wells are coming to beta 2.7 as part of the “Item Idea Contest” that we held over the last month or so. Find more information on the contest below. As always, we are offering a streamlined way to get your suggestions and ideas in for beta 2.7 as well develop it. While there are tons of things we have already added, we still have a few months of development to go before the next release. We got a ton of item submissions. Thanks for all of your ideas! Sadly, we can’t pick them all to win a place as some of the next new items to be featured in the game, but we made notes on everything submitted. So it’s possible your idea may be a future addition. In a weird turn of events, it looks as if Steam is getting to be a bit more like Discord, and Discord a bit more like Steam as of late. Wayward now has an official Steam Chat, although, we are unsure if this will actually take off the way our Discord did. In the last bit of news, it looks like Wayward finally has YouTube category. Sadly, it appears to be auto-generated with no way of updating or changing any of the information. But at least content creators can now use “Wayward” as the category instead of defaulting to Minecraft or something even less relevant which was the only option in the past. If you have created some content on Wayward on YouTube, we would appreciate it if you could update the category on your videos.